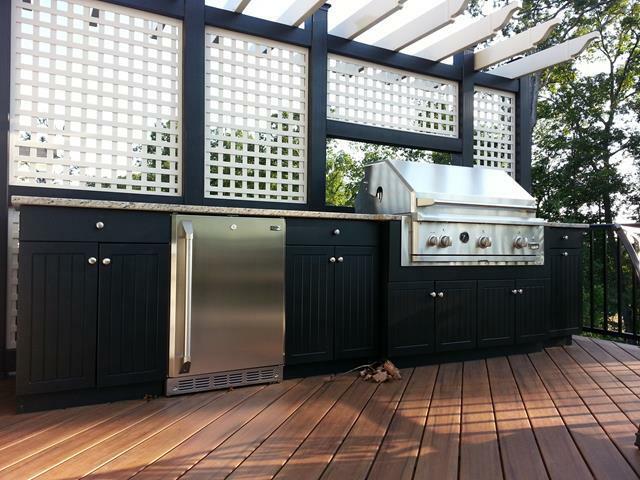 Home // Articles // What are the Best Outdoor Kitchen Cabinets for Your Yard or Patio? What are the Best Outdoor Kitchen Cabinets for Your Yard or Patio? Choosing cabinets for your home is based partly on function and partly on style. When you’re shopping for outdoor kitchen cabinets, it becomes more complex because you also have to consider how the materials will hold up to the elements and create a usable workspace. Today you can find a variety of cabinet materials that will stand up to the heat, cold, rain and snow. Some are more affordable than others, so be sure to compare both the cost and the durability of cabinets. Bamboo is eco-friendly and extremely durable, making them a popular option for back yard, deck and patio kitchens. Bamboo is attractive and stain resistant. Stainless steel is perhaps the most durable of all cabinet materials for outdoor use. It is waterproof, isn’t bothered by moisture and can hold up an impressive amount of weight. It withstands almost any kind of weather and is scratch resistant. For areas where the weather can be extreme, stainless cabinets can really shine. The classic look of wooden kitchen cabinets is just as popular for outside kitchens as it is for interior ones. For hot, dry climates these are ideal for keeping stored items cool and clean, but in areas where there is a lot of precipitation or humidity, they can fade and deteriorate if not properly sealed. They also require special care to keep them looking good and prevent warping. Masonry cabinets are custom-built for outdoor kitchens and can be made of brick or stone with doors made of veneers or other materials. These are extremely tough but are more expensive than other kinds of outdoor kitchen cabinets. If you can afford them, they will stand up to almost any temperature and weather condition. A kitchen design professional can help you determine which kind of outdoor kitchen cabinetry is best for your exterior BBQ and kitchen area.